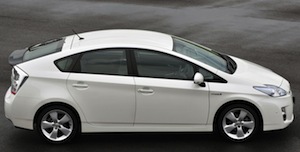 The new Toyota Prius has been voted Japan Car of the Year by a panel of experts at the Tokyo Motor Show 2009. This is the first major award for the new third generation Prius which was launched in August of this year. The Prius is a full hybrid car and uses Toyota’s Hybrid Synergy Drive system which combines petrol and electric power. From start-up the Prius can drive under electric motor power alone up to 31mph until the petrol engine kicks in. Above 31mph the Prius uses its 1.8l petrol engine and its two electric motors in synergy. When braking, and during deceleration, the electric motor acts as a high-output generator and recharges the high-power battery. This kinetic energy is normally wasted as heat when braking or decelerating. In Japan, the Prius has been the nation’s top selling new car for the past five months in a row. In the UK, Totota have received more more than 4,000 customer orders and in September its sales performance moved it up to become Toyota’s third best-seller, after Yaris and Auris.